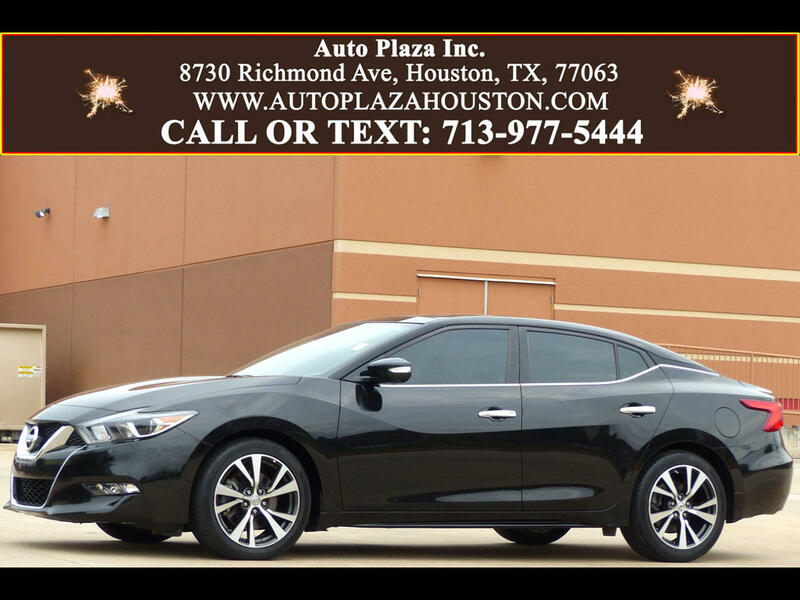 Used 2017 Nissan Maxima Platinum for Sale in HOUSTON TX 77063 Auto Plaza, Inc.
With Remaining Factory Warranty Good Thru 12.01.19 or 36K Miles!! Auto Plaza Proudly Presents to you this Hard to Find One Owner 2017 Nissan Maxima Platinum With Which Comes Loaded With Almost Every Option Compared to The Base Model Maximas!!! Options Include, Panoramic Sunroof, Navigation, 360 Degree View Camera, Front and Rear Parking Sensors, Drive Mode Selector, Remote Engine Start, Blind Spot Warning, Power Cooled/ Heated Seats With Premium Diamond Stitched Leather, Power Rear Shade, Xenon Headlights, 18' Black Alloy Wheels, Bluetooth Hands Free, Vehicle Information System, Nissan Intelligent Key with Push Button Start/ Keyless Go, Premium Bose Audio With Apple Car Play, CD/MP3 Player, Aux/ USB Audio Inputs, Fog Lights, Power Heated Outside Mirrors with Turn Signal, Automatic Dual Climate Control, Heated Leather Steering Wheel, Power Tilt/Telescopic Steering Wheel With Paddle Shifters, Traction Control, Cruise Control, Automatic Headlights, Power Windows, Power Locks, and More! This Maxima Platinum is the Vehicle For YOU Especially if you have a Family and are concerned with Adequate Space and Comfort for the Children. It is Solid, Dependable and Comfortable to Drive. There is not Much Else that We can Write to Convince You What a Great Deal This Is, BUT, You can only ever know what we are talking about when you come and TAKE A TEST DRIVE!!! CALL NOW!!! Financing Available! .. . . . . . . . . . . . . . . . . . . . . .More Pictures Available On Our Website. . . . . . . . . . . . . . . . . . . . ..WWW.AUTOPLAZAHOUSTON.COM. . . . . . . . . . . . . . . . . . . . . .